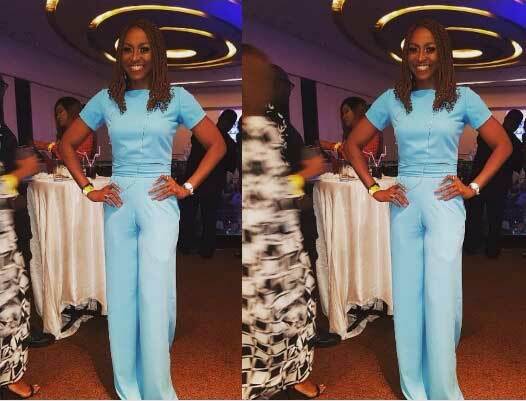 We all know how fit Nollywood actress Kate Henshaw has always been over the months, we see her train her to stay fit but her new picture is driving fans crazy. She is looking much smaller. Some fans think she is too skinny but I think she is looking fabulous …45 and Smoking Hot!!! One word of advise stay away from those Oyinbo guys! It may even help people who haven’t responded to drugs. Some people who haven’t responded to traditional treatments might do well with yoga, because unlike antidepressant drugs, yoga and deep breathing target the autonomic nervous system, Streeter says. “If your autonomic nervous system is balanced out, then the rest of the brain works better,” she says. While Iyengar yoga is generally considered to be a safe practice for people of all levels, it’s not the only type with health benefits, Streeter adds. “It depends on who the person is and what they’re looking for,” she says. For now, what’s clear is that the type with the most health benefits will be whichever kind you stick with. In a recent announcement, the FDA says that though rare, breast implants are linked to a type of cancer. Nine women in the U.S. have died due to a rare cancer associated with their breast implants, federal officials announced on Tuesday. The U.S. Food and Drug Association (FDA) reported that as of Feb. 1, the agency had received 359 reports of a cancer of the immune system, called anaplastic large cell lymphoma (ALCL), linked to breast implants. According to the FDA the risk for the cancer appears to be higher with textured breast implants as opposed to smooth ones, but the agency is not yet sure why. The FDA was able to determine whether the surfaces of the implants were textured or smooth for 231 of the implants. Among those, 203 were textured, compared to 28 that were smooth. About 300,000 women in the U.S. get breast implants each year, and cancer from the implants is rare. However, the potential risks raise questions. What are textured implants made of? There are two types of breast implants that are approved in the United States: saline or silicone gel-filled implants. All breast implants have an outer layer that is made of silicone, but they can have different shapes, sizes and textures. They can also vary in thickness. How common are textured implants? Why are textured implants used? One of the most common complications associated with breast implants is called capsular contracture, which is when scar tissue forms around the breast implant, making it hard and tight. It can distort the look of the breasts, and in some cases cause pain for women. Some plastic surgeons feel that a textured implant prevents the build up of scar tissue. Textured implants tend to be stiffer, and may be more ideal for people who want an implant with a more distinct shape. Why might they have a higher risk for cancer? The FDA says it doesn’t know why the risk appears to be higher with textured implants. The ASPS has an ongoing registry with the FDA where doctors can report suspected cases of ALCL from breast implants in order to learn more. Some research has suggested that textured implants are more likely than smooth implants to develop a bacterial coating, which may increase the risk of infection, cancer, or implant failure. However, the link is not definitive. The FDA says more research is needed to understand what’s at play. Symptoms for breast implant-associated ALCL are persistent swelling or pain around the implant. The symptoms can often appear years after the initial implant procedure. The cancer is rare, but women should also be aware of the fact that the FDA does not consider breast implants to be procedures that last a lifetime. The FDA warns that the longer a woman has breast implants, the higher her chance for complications and further surgeries, adding that few women will keep their original implants for 20 to 30 years. Here’s how a lazy day spent indoors actually affects your health. One day inside probably won’t hugely affect your health—but it’s not great to constantly stay cooped up from morning until dark. The biggest issue is that entering hibernation mode means you don’t get any exposure to natural light. Sunlight tends to improve your mood, and it helps your body produce vitamin D, which has been shown to help regulate the immune system, reduce inflammation in the body, and more. Sunlight also helps keep your internal body clock on schedule; your circadian rhythm plays a major part in regulating your appetite, sleep schedule, and energy levels. Research has shown that excessive exposure to electric lighting can throw off those internal rhythms. Let’s not forget the slew of health benefits that spending time in nature provides: Getting some green can help alleviate symptoms of depression, up your energy, and improve your overall well-being. Also, a study out of University of Glasgow in Scotland found that people who walked, ran, or biked in nature had a lower risk of poor mental health than people who exercised at the gym or at home. I understand that on certain days it can feel impossible to spend substantial time outdoors. Just don’t make cocooning a habit. And keep in mind that carving out even 20 minutes per day of “ecotherapy,” as some call it, can do your mind and body good. Besides the well-known symptoms—like constant thirst and a frequent need to pee—here are a few other subtle signals that something may be wrong. In some cases, though, there are sneaky signs. Some early diabetes symptoms are well-known: constant thirst, excessive urination, or sudden weight gain or loss, for example. Others, like the ones below, are more easily missed—by medical professionals and patients alike. If you’re experiencing any of these, be sure to bring them up with your doctor. Periodontitis—also known as gum disease—may be an early sign of type 2 diabetes, according to new research published in the journal BMJ Open Diabetes Research & Care. The study found that people with gum disease, especially those with severe cases, had higher rates of diabetes (both diagnosed and undiagnosed) and pre-diabetes than those without. The connection between gum disease and diabetes isn’t new, says Dr. Tamler, and it appears to go both ways: Having either condition seems to increase the risk of developing the other. “Inflammation caused by gum disease eggs on the same factors that are responsible for high blood sugar that cause diabetes,” he says. “Long before you actually get diabetes, you may notice a dark discoloration on the back of your neck,” says Dr. Tamler. This is called acanthosis nigricans, and it’s usually a sign of insulin resistance—a loss of sensitivity to the hormone the body uses to regulate glucose—that can eventually lead to full-blown diabetes. In rare cases, acanthosis nigricans can also be caused by ovarian cysts, hormonal or thyroid disorders, or cancer. Certain drugs and supplements, including birth control pills and corticosteroids, can also be responsible. Of course, these strange sensations could be caused by something as simple as wearing high heels or standing in one place for too long. But they could also be caused by other serious conditions—like multiple sclerosis—so it’s important to mention them to your doctor. Elevated blood sugar levels can damage your retinas and cause fluid levels around your eyeballs to fluctuate, leaving you with blurry or impaired vision. Once blood sugar levels return to normal, eyesight is usually restored—but if diabetes goes unmanaged for too long, the damage could become permanent. In a scientific review presented last year at the European Association for the Study of Disease annual meeting, people who took daytime naps longer than an hour were 45% more likely to have type 2 diabetes compared to those who napped less or not at all. It’s not likely that snoozing during the daytime actually causes diabetes, say the study authors. But they say that it can be a warning sign of an underlying problem like sleep deprivation, depression, or sleep apnea—all conditions associated with an increased risk of diabetes. We’ve all been there. Here’s how you should actually respond. When people are anxious before getting surgery, doctors and nurses often tell them to take slow, deep breaths with long exhalations. It may seem like an inadequate way to quell anxiety, but in many cases, it actually works. Now scientists describe why deep breathing, including the breath-focus of meditation, can induce such calm and tranquility. In a paper published in Science, researchers led by Mark Krasnow, a professor of biochemistry at Stanford University, found that in mice, a group of nerves in the brain that regulates breathing has a direct connection to the arousal center of the brain. In other words, breathing can have a direct effect on the overall activity level of the brain. Krasnow’s team has been studying a group of 3,000 neurons in the brain stems of rodents that control all of a mouse’s different breathing patterns, from the quick, rapid breathing associated with exertion and excitement, to the slower breathing typical of rest, to sighing and crying. Krasnow found that about 60 types of nerve cells make up this so-called “breathing pacemaker”, and each of these nerve cell groups are responsible for different breathing patterns. In the study, the group was trying to isolate the different types of neurons and their various effects on breathing. Using a genetic technique, they silenced specific neurons to see what breathing function was disturbed. Their first experiment seemed like a failure when the researchers manipulated one set of neurons, yet the mice didn’t show any changes in their breathing. “We were very disappointed initially,” says Krasnow. They put aside that experiment and moved the manipulated animals to a new cage environment. But that’s when they noticed something novel. Normally, moving mice makes them nervous and obsessive about exploring their new surroundings. But instead of sniffing and running around, the mice with the changes in their breathing center seemed to “chill,” says Krasnow. They continued their at-rest behavior: grooming themselves and hanging out without a need to urgently investigate their new surroundings. It turns out that Krasnow had disrupted a set of nerves with a direct line to the brain’s arousal center; these nerves can either tell the brain there’s an emergency and set off the body’s alarms, or keep the brain on an even keel, maintaining a sense of calm. This is the change that happens when breathing slows down, says Krasnow. “This liaison to the rest of the brain means that if we can slow breathing down, as we can do by deep breathing or slow controlled breaths, the idea would be that these neurons then don’t signal the arousal center, and don’t hyperactivate the brain. So you can calm your breathing and also calm your mind,” says Krasnow. So why do some people still feel anxious after a few deep inhales and exhales? It’s possible that their genetic variations mean they have a dulled response to this cluster of nerves responsible for regulating breathing, so that it takes more than conscious deep breaths to switch the brain from an aroused to a calm state. In those cases, having something like a drug or other intervention to specifically target the right group of breathing nerve cells and control its activity might be needed. That’s where Krasnow hopes the work will lead: to a way to better control the calming effect that deep breathing can have on the brain. In the meantime, he says, don’t dismiss deep breathing as a way to combat stress and anxiety. There’s now a scientific explanation for why it works. A recent study shows that a percentage of pregnant American women who contracted the Zika virus had children or fetuses with birth defects. About 10% of pregnant American women who contracted the Zika virus had children or fetuses with birth defects, according to the Centers for Disease Control (CDC) data released Wednesday. The latest CDC analysis spans the 50 states and the District of Columbia; nationwide, 1,297 pregnant women with laboratory evidence of potential Zika infection across 44 states were reported to a central federal database called the U.S. Zika Pregnancy Registry last year. And 51 fetuses or infants out of the nearly 1,000 completed pregnancies out of this group has birth defects associated with the mosquito- and sexually-transmitted pathogen, including 43 with microcephaly—abnormally small heads—or problems with the brain and central nervous system. Other suffered issues with their eyes and neural tube defects, and another 77 of the pregnancies resulted in the loss of the child. Those numbers add up to a 5% birth defect rate among these pregnancies. But it’s actually even worse for those who had lab-confirmed (rather than just potential) Zika infection. Out of the 250 women in that category, just under 10%, or 24, fetuses and infants had birth defects. The 51 babies or fetuses with Zika-associated birth defects were born to mothers who were exposed to the virus in 16 countries or U.S. territories with a higher prevalence of the infection, such as Brazil, the Dominican Republic, Mexico, and Puerto Rico. Last August, a Texas baby became the first known Zika fatality in the U.S.
What’s particularly concerning about the CDC’s analysis is that “laboratory evidence of possible recent Zika virus infection and the number of fetuses/infants with Zika virus–associated birth defects continues to increase in the United States.” That meshes with earlier agency data finding that pregnant women with Zika are 20 times more likely to have children with birth defects. “The proportion of fetuses and infants with birth defects among pregnancies with confirmed Zika virus infection at any time during pregnancy was more than 30 times higher than the baseline prevalence in the pre-Zika years, and a higher proportion of those with first trimester infections had birth defects,” wrote the CDC.